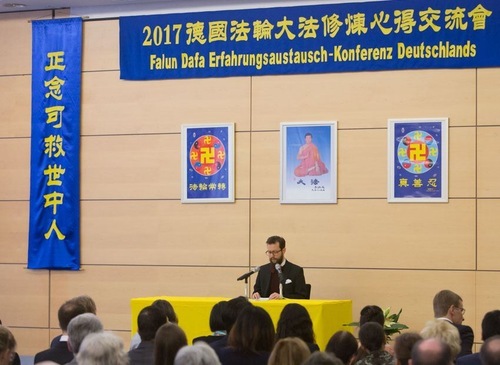 The annual German Falun Dafa Experience Sharing Conference was held on January 8, 2017 in Kassel. Fourteen practitioners shared their experiences and insights gained on their path of practising Falun Dafa. Robert, a young practitioner, shared how he learned to follow the principles of Truthfulness-Compassion-Forbearance and to be considerate of others. 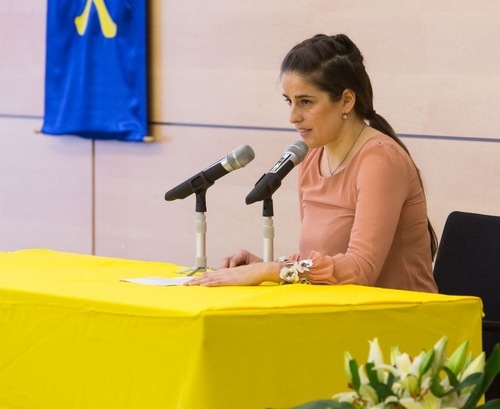 He and two other practitioners were once at a booth during an event to introduce Falun Dafa to the public, and one of the practitioners left early. Disappointed and angry, Robert felt that that practitioner was selfish, as if abandoning fellow soldiers on a battlefield. Through discussion with others, Robert realized that his mindset was not correct, since a genuine practitioner always appreciates each cultivation opportunity and thanks those who help him or her grow and improve as a practitioner. He realized that the practitioner who left early must have had reasons to do so. After identifying his attachment—always expecting others to do things according to his plan, Robert no longer felt hurt and his negative feelings about others disappeared. Ms. Sun, a practitioner from Switzerland, told her story of selling tickets for Shen Yun Performing Arts. Because there were no practitioners available for two coordination roles, she took on both of them. She was frustrated in the beginning, and wondered why nobody else wanted to work on them except her. She later realized that, as a practitioner, she should not think that way. After all, a practitioner is supposed to let go of selfishness and do whatever is needed to get the job done. Ms. Sun looked inward and found more human notions, including attachments to comfort, to self, and ego. Because of fear, she also lacked righteous thoughts. When she gradually let go of her human notions, the capacity of her heart kept increasing and the difficult tasks also became easier. A tribulation in Haroldo's cultivation taught him the importance of letting go of life and death. Upon hearing from a doctor that his illness was incurable, Haroldo felt hopeless. He then turned to the founder of Falun Dafa, Master Li, for help. “Master, I do not know what I should do now. Please help me,” he said in his mind. At that point he was willing to give up everything and only follow Master. When he woke up the next morning, Haroldo said that he felt much better than before. Recalling a Minghui.org article in which a Chinese practitioner kept reciting the Fa while imprisoned in China, Haroldo also decided to memorize Zhuan Falun. “Although I have read the book many times in the past, it now seems like a new book to me,” he shared. Little by little, his pain disappeared and he fully recovered his health. Because many Chinese people have been misled by the Chinese Communist Party's defamatory propaganda about Falun Dafa, Ursula and another practitioner often go to Cologne Cathedral, a popular tourist site, to reach out to visitors from China. 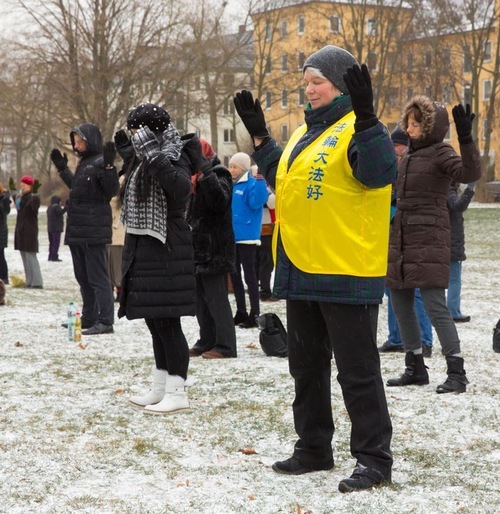 Over the past eleven years of these activities, many Chinese tourists have learned the facts about Falun Gong from them. Quite a number of tourists have quit the communist party and its affiliated organizations upon learning how the Chinese regime has harmed its people for decades. During this long-term effort, Ursula has encountered many opportunities to raise her xinxing. Once, a practitioner criticized her during a group discussion. Frustrated, Ursula felt like she wanted to stop going to the tourist site and even to switch to another Fa-study group. Upon thinking about this further, she knew that she should handle the situation like a genuine practitioner, so she decided to stay. Nonetheless, the negative feelings from that practitioner still bothered her and even affected her collaboration with other practitioners. Ursula then came to understand that this was interference, attempting to use this incident to drag her down. She therefore decided to let go of her human notions. A story that Ursula had seen in a Shen Yun performance several years ago also helped her work through the situation. The story told how a girl in ancient China became pregnant and delivered a baby before she was married, something very disgraceful in that era. To dodge responsibility, the girl said that a well respected monk in a nearby temple was the boy's father. Despite the great humiliation, the monk in question did not defend himself but accepted the baby into the temple and began to raise him. Later, the child's biological father passed the imperial examination and was appointed a high-ranking officer. It was not until the parents came to pick up the child that people learned the truth and their contempt towards the monk turned to respect. Compared to what the monk had suffered, Ursula knew that what she had to endure was minimal. She gradually left the frustration behind and continued to do well in her cultivation. Dima, who often goes to tourist sites in Frankurt and Berlin, was initially worried because he could not speak Chinese: How could he communicate with Chinese tourists? Inspired by another practitioner, he began to broadcast truth-clarification audio files to Chinese visitors through a speaker. At first, the nearby merchants complained about it, but they later understood and became supportive after Dima explained to them why he was doing this. 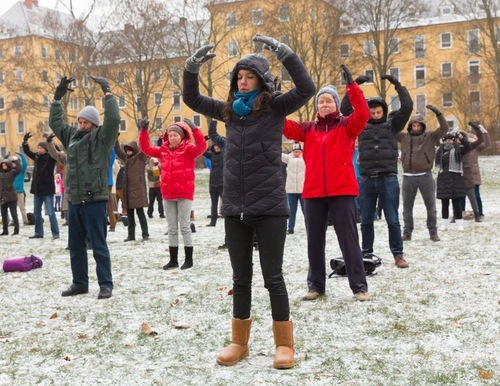 Ms. Wang began practising Falun Dafa four years ago. 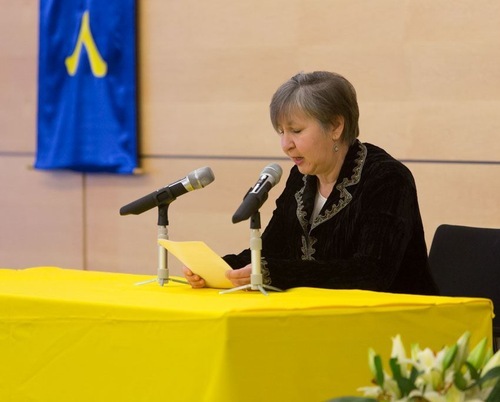 Since May 2015, she has been making phone calls to China to tell people the real story of Falun Dafa and debunk the hate propaganda from the communist party. Ms. Wang said that when she first started to make such phone calls, she was afraid that people would give her a hard time. Influenced by the communist party culture, she was also fearful of powerful people and high-ranking officers. Once, while reading Zhuan Falun, Ms. Wang noticed the phrase “Zhen-Shan-Ren is the Sole Criterion to Discern Good and Bad People.” She realized that she had been judging people with human notions. That is, she tended to think about things with everyday thoughts, instead of thoughts based on the Fa. Since making that realization, she changed her mindset and was no long intimated when making phone calls to China. After the conference, many practitioners said that they were moved by the sharing and were inspired to do better in their own cultivation practice. They also felt a renewed commitment to share Dafa with more people and to expose the persecution in China.